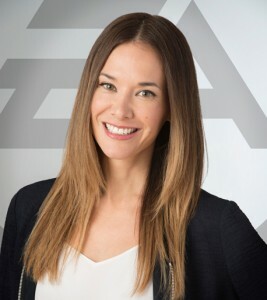 The videogame festival honors Jade Raymond for her outstanding career, recognizing her contributions to the industry as a producer of games that are considered a turning point in the industry, as well as a source of inspiration for many subsequent titles. Today, Fun & Serious announced that it will recognize Jade Raymond with an honorary prize at its eighth annual event, which will be held from December 7th to 10th in Bilbao, Spain. Raymond will be awarded the Pioneer Award, for her prolific career in the videogame industry. From the early 2000s until present day, the Canadian has worked at some of the largest companies in the sector (Sony, Ubisoft, Electronic Arts (EA)), and now holds the position of Senior Vice President and Group General Manager of EA’s Motive Studios (Montreal, Vancouver). In addition, she sits on the Board of Directors of AIAS (Academy of Interactive Arts and Sciences), and the Board of Directors of C2 Montreal. Passionate about games since childhood, she initially joined the industry as a programmer and since then has focused on bringing innovation, new mechanics and gameplay to action-adventure and online multiplayer games. Raymond has played a key role in creating the Assassin’s Creed and Watch Dogs franchises and founded the Ubisoft Toronto studio which developed blockbuster titles such as and Splinter Cell: Blacklist by Tom Clancy. The worlds she has helped create have inspired novels and great movies. At present, Raymond continues to pioneer through the development of Motive’s original IP, as well as through Star Wars projects that are in the works right now in both Montreal and Vancouver.She is responsible for the HD Star Wars portfolio across EA. With this award, to be presented at the traditional Awards Gala at the Guggenheim Museum on the evening of December 10th, the Fun & Serious Festival will not only recognize the importance of Raymond’s achievements and career, but also her significant role in the electronic entertainment industry, as one of the creators behind titles that elevate videogames to the category of art, making her one of the most influential women in the industry. In addition to her attendance at the Awards Presentation Gala, Raymond will take part in the VIT Talks, a series of talks led by experts in videogames, where innovation and the latest trends are discussed, organized within the framework of the festival and where numerous key industry figures and the public can connect. Over the past eight years, the Fun & Serious Festival has become a key meeting point for the industry, focusing on elevating videogames to the category of works of art, at the same level as film or music. In this respect, the festival seeks to recognize the importance of an industry that enjoys robust health both in the world and in Spain: In 2016 the effective output of the videogame sector in Spain reached 1,177 million euros. Its added value was 503 million euros and it directly employs 8,790 people. The videogame industry accounts for 0.11% of GDP. Globally, the industry grew by 8.5% in 2016 compared to the previous year, achieving an overall turnover of 99.6 billion dollars (Source: AEVI, the Spanish Videogames Association).